Luminous Lights Show is thrown as required at Live Show Theater in the House where you can experience up close fire squid and wonders of deep sea creatures as called for. This is the most popular Luminous Lights Show of Firefly Squid you can see only this time in spring. After projecting a VTR introducing firefly squid fishing and sightseeing in the ocean, explains the ecology of the Ocean. 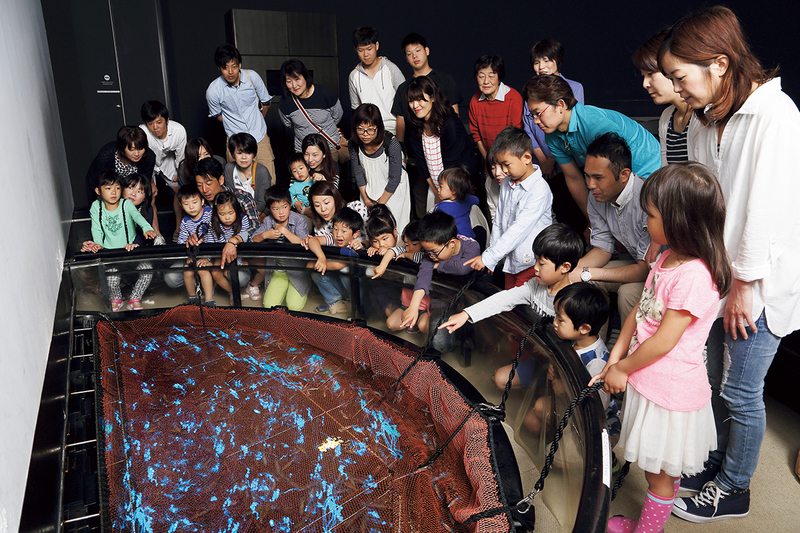 At the end, there is a chance of participating in a tug of war on the part of a few visitors to enable him or her to see up close to give an impetus to firefly squid in the special tank by dropping a rope and see the situation and light emitting and all. The last show begins at 16:30. Subject to change depending on group reservation status and such. There is a chance of cancelling of Lights Emitting Show without notice due decrease of firefly squid toward the end of May. Announcement of narration and explanation is done in Japanese. The contents of the season you see Fire Squid (March 20 to the end of May) and the off-season you are unable to see (June 1 to March 19) will differ. Please enjoy LED lights show imaged after firefly squid when actual firefly squid is not in season. You can also see the Lights-Emitting Show of dragon palace fire fly (deep sea fire-emitting plankton). You can see mysterious pale-white lights near-by from the deep sea. It’s luminous plankton living deep in the sea with its scientific name (conchoeciapseudodiscophoraq). However, there is no official name for the creature yet, it has been called “dragon palace firefly” in association of firefly living in the dragon palace in deep sea. The size is 0.5 -2 mm. Long and narrow oval shape. It belongs to shell fish in Crustacea and many lives in 300 – 400 meters deep in the Japan Sea. The longevity is 30 months. The male length is 1.22 mm and female 1.6 mm. A adult female gives birth each year and bears 1 to 10 eggs each time. It emits from around the upper lip thus emitting lights in chemical reaction. We gather plankton in a collection net at a deep water sluice gate. There is the screen for projecting VTR on the half-moon shaped water tank in the main facility, Live Theater of the Museum, with the capacity of 100 spectators including standees. At the show start time, you are guided to the theater. Be careful of your footstep that the theater gets dark during the show time. Copyright © Wave Namerikawa. All Rights Reserved.